For most people, ironing is a chore that is at the bottom of their home to-do list. If your iron is dirty, it can cause a lot of issues. Over time, the water that you put in the iron can leave behind mineral deposits that, in turn, can clog the steam vents, resulting in your fabrics becoming stained with rust and mineral filled spots. If you like to use a spray on starch or other products when ironing, you can end up with unsightly gunk on the plate of the iron. Here’s how to clean an iron using everyday products and simple techniques. To avoid having problems with your iron, you can employ a few simple tricks that will help to keep it from becoming damaged and ruining your clothes. If you use a steam iron, it is essential that you only use distilled water in the reservoir. Water from your kitchen or bathroom facets contains chemicals and minerals that can destroy the water reservoir and clot the vents. Also, you should never store an iron with water in the water tank. After you’ve completed your ironing, be sure to dump out the water and wipe away any exterior moisture. When you choose to use spray on starch when you iron your clothes, you may have started to notice scorch marks on the iron plate. Fortunately, this problem is relatively easy to clean iron plate with a simple paste of baking soda and water. You should never wash the sole plate of the iron with harsh chemicals that could scratch the plate because once the finish is marred, it is almost impossible to prevent staining or rusting. To clean sole plate, make sure to unplug the iron and ensure that it is cool before starting the cleaning process. 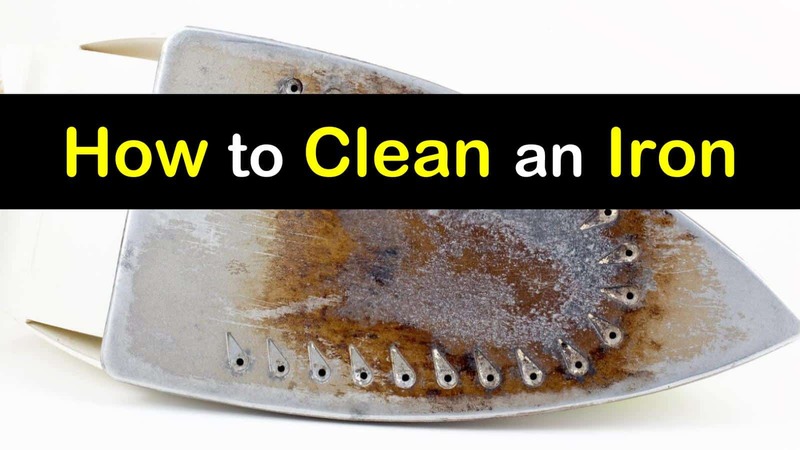 Here’s how to clean the sole plate of an iron. Mix one tablespoon of distilled water with two tablespoons baking soda and form a slightly runny paste. Make sure the iron has completely cooled and unplugged before you start your cleaning. Apply the paste directly to the surface of the iron plate. If you have a lot of buildup on the plate, allow the paste to sit for several minutes. Use a clean cloth or paper towels and dip it in a bowl of hot water. Wring out the excess water and then wipe the paste off the iron. Use a cotton swab dipped in water to clean the steam holes on the plate. If you have an especially dirty sole plate, you can also use some fine steel wool to gently rub off any scorch marks that may still be visible. You can also clean the sole plate with toothpaste. Add a small dab of toothpaste to a damp cloth and wipe down the surface of the plate. Use a clean cloth to rub the toothpaste off, then set the iron on steam and iron a cloth for five minutes. If your iron has a non-stick surface, you can clean the soleplate with a soft cloth or paper towel, warm water, and mild liquid detergent. You never want to use an abrasive cleaner on irons with a non-stick coating because the abrasive material will wear away the surface. If your steam iron has begun to sputter and leaves rusty or mineral-filled water spots on your clothes, then it’s time for you to give it a good cleaning on the inside. When the steam vents have become clogged, you’ll start to experience problems with your iron. When cleaning a steam iron, you can purchase a commercial steam iron cleaning product, but your iron manufacture will void the warranty. These kinds of iron cleaner products can be extremely harsh and can end up causing additional damage to your iron. Distilled white vinegar is a more gentle and less expensive alternative when it comes to cleaning your iron. Here’s how to remove mineral deposits and other grime from your iron. Start by mixing half a cup of vinegar with half a cup of distilled water. Pour the mixture into the iron. Place the iron in an upright position on a sturdy surface and carefully inspect the steam ducts. If you notice white residue in any of the holes, you can use a toothpick or old toothbrush to remove the build-up. Avoid using metal materials as they can scratch the soleplate. Next, plug the iron in and turn it on and set it to the steam function. Allow the iron to heat up for at least five minutes. Then, depress the steam button and hold it for at least 20 seconds, or until steam flows freely out of the vents. Repeat this process at least six times. Turn the iron off and unplug it from the wall to allow it to cool completely. Once the iron is cold, dump out any remaining mixture from the reservoir. >> Expert Tip: Use a vinegar-water solution for cleaning cast iron furniture. While you may use your iron on a regular basis at home, it is an appliance that often is neglected when it comes to regular cleaning and maintenance. If you notice that the base of your iron has started to turn darker in color, then you’ll want to clean it to avoid unintentionally damaging your clothes. You can clean a burnt iron with lemon and baking soda. The acidic properties of the lemon, when combined with the baking soda will remove the harmful substances that have stained the bottom of your iron and return its shiny appearance. Mix the lemon juice with the baking soda until you form a thick paste. Rub the paste over the cold iron and let it sit for at least five minutes. Use a damp cloth to remove the paste. Turn the iron on and allow to heat for a few minutes to dry the iron’s bottom plate. >> Cleaning Tip: Lemon juice and white vinegar make the perfect cleaner for rust stains on concrete. If melted plastic is marring the surface of your iron’s sole plate, there are ways to remove it with aluminum foil. Place the foil on the ironing board and sprinkle the surface with table salt. When you iron over the salt and aluminum foil, the plastic will start to loosen. Then, you can use a plastic spatula to scrape off any remaining residue. When it comes to your iron, you want to make sure that it is working correctly and won’t damage your clothing. Proper cleaning and maintenance are critical if you’re going to keep your iron working correctly. 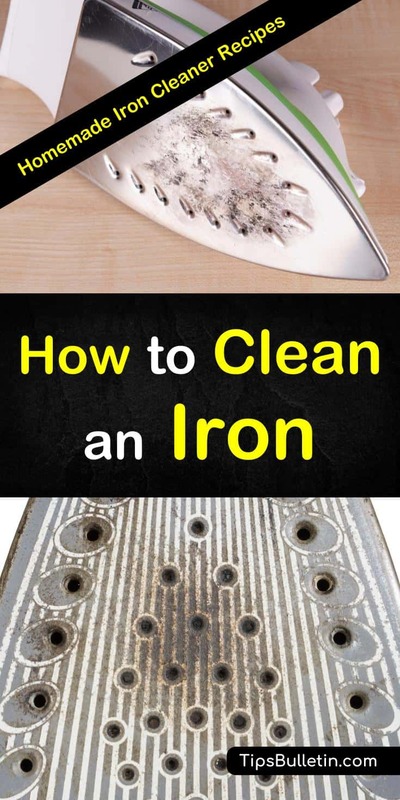 These simple tips and techniques, along with a little elbow grease will keep your iron clean and working the way it is meant to work. We hope you enjoyed learning about how to clean an iron. If you found the information in this article helpful, please feel free to share it with all your friends and family.